Yesterday I went to meet friends in Normandie. These days if you travel in a car in France you better use Waze. It will tell you if there are some unexpected delays and traffic jams: “Gilets Jaunes” – ‘Yellow vests’ – have started to block routes and roads as part of their protest movement. So, I used Waze driving both directions, to Normandie and to Paris, but luckily, we haven’t got blocked. And yet we have seen many “Yellow vests” along the way, on all major “rond points” (this is how roundabouts called in French). People in yellow vests were standing under improvised tents (it was raining all day), warming up from fires they have made on the roadside and frying food on improvised barbecues placed on empty barrels. On some roundabouts there were a dozen of them, on some up to two-three dozens. By the way, we did have a surprise on the way back – the toll station on A13 route was surrounded by the protesters and the toll machines were disabled. 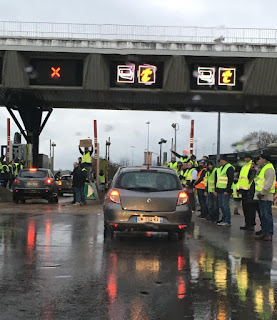 One of the “Yellow vests” was holding a carton with words: “Péage gratuit” (‘Toll free’). All vehicles passed the toll station for free, and some of them honked in gratitude and, possibly, in solidarity with the protesters. The “Yellow vests” movement started two weeks ago in a protest to government’s decision to raise taxes on gas on January 1, 2019. President Macron explained his strategy of encouraging transition to environmentally friendly technologies and the need to raise taxes on petrol. Another measure that infuriated many was government’s plan to introduce anti-pollution tax on diesel. 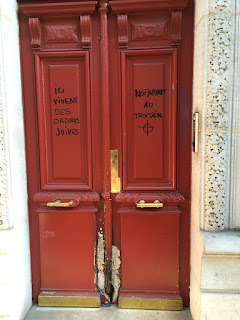 Many residents of the suburban areas, which are the backbone of this movement, responded to those decisions with cries of “ras-le-bol”, a French for “Basta”, or “fed up”. Population of the suburban areas doesn’t have access to public transportation like residents of big cities and prices of gas and diesel are very important to them. It should be reminded that the new taxes on gas are not unprecedented in France. The problem is that the economic conditions of the working-class families, as well as for middle class and retirees, were deteriorating, with social benefits being cut in the last two years. The people had the feeling they became transparent for their own government, so they took it to social media to organize a protest and came up with the idea of “yellow vest” – the same vests the French drivers are obliged to put on in case of traffic accidents and make them visible. The roots of the economic problems for residents of French suburbs, or as they call it “zones périurbaines”, go back to the 1980, when government encouraged people to move in to these new communities outside big cities. These communities attracted people who were looking for relatively cheap houses and apartments located in areas supplying all modern facilities and infrastructure. However, most of the apartments were purchased in credit. Look at the numbers: in 2015, the households’ indebtedness was 61% of their disposable income against only 31% in 2001. In 2016 it rose to 88.8%, and in 2018 – 93.9%! in the context of this economic burden, the gas taxes were apparently “la paille qui a cassé le dos du chameau” – the straw that broke the camel's back. While the deteriorating conditions of the middle and working class were not a secret to anyone, the “Yellow Vests” movement has been a surprise in France. It is a true grass roots movement for economic justice who had been organized through social media, mainly on Facebook and Twitter. On the first weekend of protests (November 16-18) almost 300.000 people took part in demonstrations. No political party or trade union was involved in preparations. Last weekend (November 24-25) the numbers were significantly lower (about 100.000 in the country, 8.000 – in Paris), however, the images from Champs-Elysees on Saturday shocked many in France and abroad. The speakers for the movement, as well as journalists and experts, argued that the breakers and thugs who set on fire the avenue and threw stones at police officers belong to extreme-right and extreme-left groups and are not related to the “Yellow vests”. No doubt, lack of structure and clear boundaries could damage the image of the movement which so far has enjoyed a broad support of the French people, about 70%. And yet, in the light of this public support, and despite the amateurish nature of the protest, the French government will have to find ways to communicate with “Yellow vests” and take their concerns seriously. While the protest started with economic demands, the slogans “Macron demission” are not rare anymore. Opposition political leaders support the movement and their demands, both Jean-Luc Mélenchon from left and Marine Le Pen from right. French President is scheduled to make a speech tomorrow that will explain his vision of ecological transition and how to make it “acceptable and democratic”. Political commentators don’t expect him to give up on his plans, but can he really ignore the “Yellow vests’” protest? May be, we will have the answer tomorrow. Yesterday the most beautiful avenue in the world was lit up by one million lights. 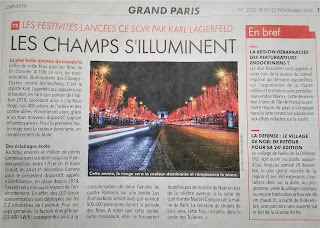 In a kick-off ceremony the lights decorating 400 trees of Champs Elysées were switched on by Karl Lagerfeld and the mayor of Paris Anne Hidalgo. The avenue was lit in red – the color of this year’s illumination theme – and every day from now on until January 9, they will shine between 5pm and 2pm, attracting thousands of people for this festival of light. 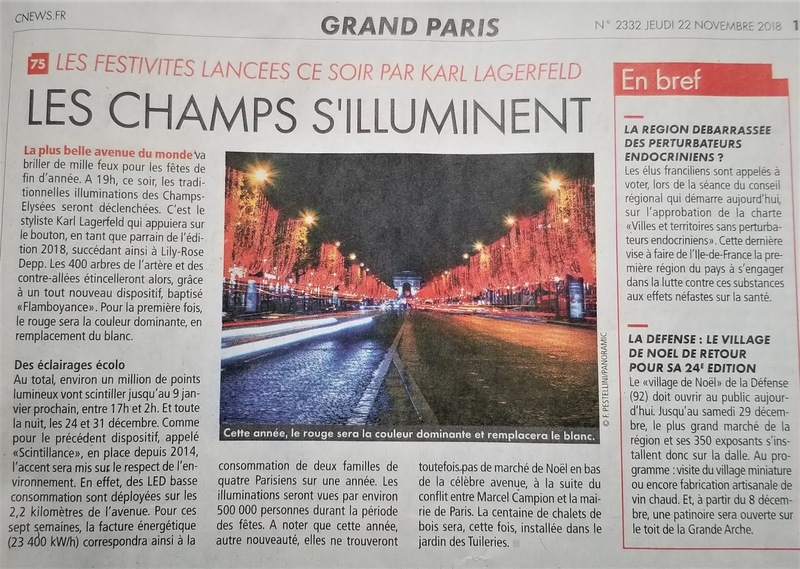 And if you are a person who is concerned by energy and environmental issues, the organizers explained that the total amount of electricity needed for this celebration equals a one-year consumption by two 2 Parisian families of 4 people, thanks to a special energy-saving technology called “Scintillance”. It’s been a long tradition in Paris, as well as in so many other cities in France, to decorate and light up central streets during the Holidays. But the illumination of Champs-Elysées is absolutely magic. When you see this sea of lights sparkling in the cold and clear air of December you can’t resist the feeling of being in a fairytale, in a dream. You feel like a kid who wants to believe in miracles, to think that everything is possible. The reality, for a moment, melts into this cold air, and hope warms your heart and your body. Can we stop the moment? can we defy the comeback of reality? Can we keep the lights inside us after the festival is over? If you have a chance, come and see the magic. Happy holidays! One of the privileges in reading French newspapers is that beyond news, opinions and analysis, you also have a regular access to essays full of intellectual and philosophical reflections. Philosophers and writers are still hold in high esteem in France and benefit from a special attention of the media. 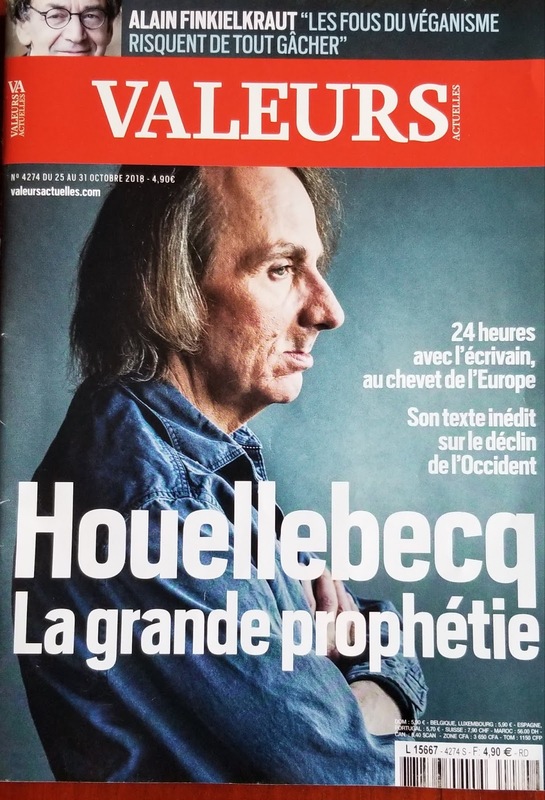 The cover of the weekly “Valeurs actuelles” (‘Modern values’) from Octobre 31 was very promising: it had the picture of Michel Houellebecq with the following title: “Houellebecq: La grande prophétie”. 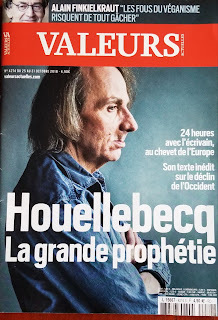 “Valeurs actuelles” dispatched a journalist to accompany Houellebecq on his way from Paris to Bruxelles where this outstanding, probably the most famous living French writer, was to receive the first prize of the Oswald Spengler society. The interview with Houellebecq in a train from French capital to capital of Europe, as well as his speech at the award ceremony, focused on the decline of France, Europe and the West in general. And for Houellebecq, the word “decline’ is, in fact, almost too soft. For “Valeurs Actuelles”, which is considered one of the most conservative newspapers in France, it is not surprising to make a cover about the decline of the West. Founded in 1966 and self-defined as liberal-conservative newspaper for much of its history, in the last six years and particularly since the appointment of Yves de Kerdrel as editor-in-chief, its ideological orientation has changed. “Valeurs Actuelles” became a voice of the more conservative part of the French society, that speaks for traditional values of church and society, that unapologetically questions immigration policies and is very frank about the dangers of radical Islam. For Oswald Spengler society it is also not surprising to give its first award to Houellebecq. As Spengler 100 years ago announced the decline of the West, the French author is considered today to be an oracle of the final degradation of the Western civilization. What is surprising though, is that Hoellebecq concluded his remarks at the event on a quite optimistic note. The reason for his optimism is not rooted in the current trends in French and European society but rather in the historical parallels and dialectical thinking (even though he qualifies Marxism of “intellectual indigence”). First, according to Houellebecq, falling birth rate in France could be reversed as it has already happened in the past during the most difficult times for his country – Nazi occupation. 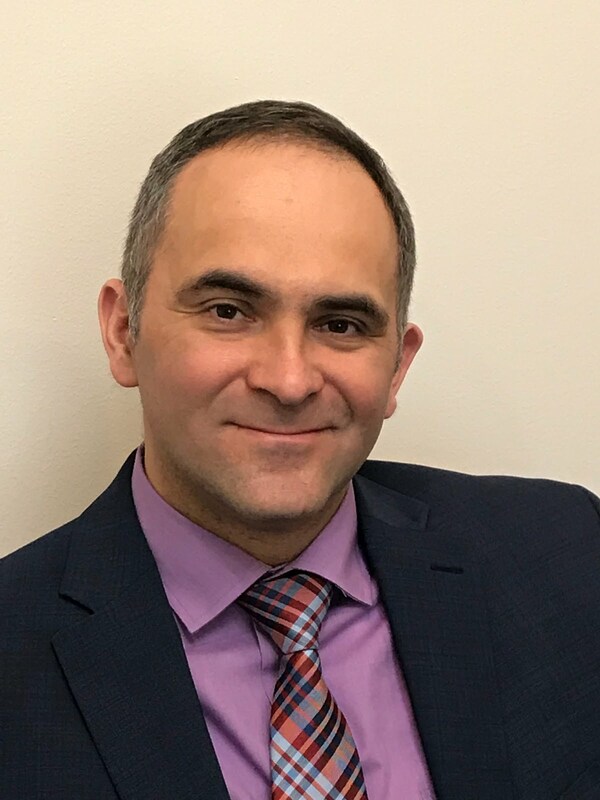 His second hope comes from the fact that Catholicism could experience revival in France, exactly as … Islam experienced revival in Arab world after an attempt of secularization at the beginning of the 20th century. I believe many people call Houellebecq’s writing prophetical because of this kind of prophecies. He himself, in the interview in “Valeurs Actuelles”, mentions the realization of one of his predictions - the UK leaving the EU – which he made five years before it happened. He also refers to his another prediction, or you can say his wish, that is yet to be realized - the collapse of the EU, which he accuses of no less than “assassination of its own member-states”. I believe, in trying to prove his forecasting capability through this kind of predictions the author is a little bit flirting with self-admiration. The prophetical value of Houellebecq books comes of course from his identification of the general feeling of malaise of our society and merciless description of its expressions and evolution. His heroes are people in the West who lost their values, their identities, their past and their future. They live in the present and in the moment, decadently escaping from any significant social commitment, and are not capable to defend their values even though they realize the grave consequences. 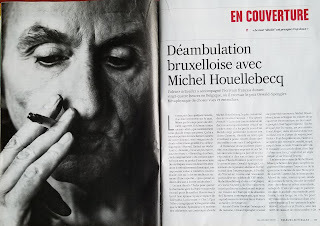 And Houellebecq systematically and, again, mercifully, brings the mirror in front of us and in front of himself. His own prophecies turn upside down his believes he expressed in the books. Expressing his loathe for the institute of marriage he recently … married. Being deeply anti-religious person, he now believes that survival of the Western civilization depends on revival of the church. Just echoing some older prophets, who became prophets against themselves and against their own views, but who couldn’t escape telling the truth to their people and their countries. He is like modern Jonas who must bring the message to inhabitants of Nineveh, despite and against himself. Houellebeck will publish his next roman in 2019. Stay tuned. May be that was the reason for me to attend the conference on antisemitism a few days later. 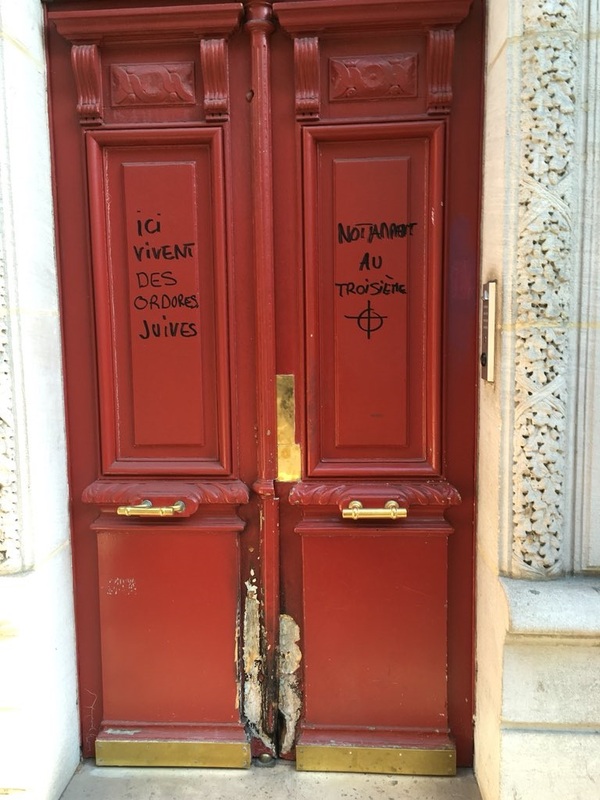 “Colloque antisemitism 2018”, as it was called in French, was hosted at one of the hotels in Marais neighborhood, known for its Jewish past and present. You couldn’t think about more symbolic place in Paris to hold this conference, as Marais was also a place of anti-Semitic terrorist attack a few years ago. But what no less symbolic about this conference is that for the first time in France it was organized by Conseil national des évangéliques de France (Cnef) – National Council of French evangelicals. The French evangelical community, said the President of CNEF, Étienne Lhermenault, stands in solidarity with the Jewish community in the face of the growing antisemitism in France and in Europe. “There is a real emergency, but unfortunately it goes under the media radars and this is despite a worsening of the situation.” The conference featured prominent speakers coming from Christian and Jewish community who dealt with theological issues, the history of the Christian philo-semitism and Zionism, preservation of the Holocaust memory and so many other topics (here you can see the program of the conference: http://www.colloqueantisemitisme2018.org/). The conference has got some media attention from La Croix newspaper. The evangelical community was growing in France in the last 50 years. Today there are about 2500 evangelical churches in France (about 70% of them affiliated to CNEF) and about 650.000 worshippers. But look at this number: according to CNEF, every ten days there is a new church opening its doors in France. Of course, the evangelical community in France is not as strong and influential as American evangelical community, but there is no doubt: French evangelicals will play a greater role in French society in the years to come, and that is why their call to action against antisemitism is so important. Hope to see you again on my Paris journal!